Beautiful metal band complements the elegant dial...friend who collects expensive watches was amazed at the value for the price.....many compliments from others....I have 8 Stauer watches and this is a favorite. Just received my watch and am very impressed. Much nicer then expected. Quality is outstanding. Looks fantastic. Highly recommend to anyone. INCREDIBLE! Just "hefting" it feels like uv taken control of ur world, temporally at least. Beautiful, buttons, baubles, bangles - no beads. Looked thru the enclosed catalog; now I KNOW I've chosen the Alpha watch! Is it possible, after all these decades: a FUN chronometer? Fun to set, measure, announce world times and to SHOW-OFF & impress. Looking forward to my next date's reaction and to parade this beauty in a tux. Deals galore. Saving REAL money on fashion + function is the definition of value. A great toy, statement, representative of who I am. Love all your watches and I consider your Blue Stone one of my favorites. . Keep us all wearing Stauer watches by coming up with very good products. Can't wait to see and purchase more watches from you guys. Thanks. This watch was a birthday present for my husband. Although the picture is wonderful, it doesn't do justice to the watch, it's so very beautiful! My husband is over the moon! Thank you Stauer! Absolutely delighted with my Blue Stone Chronograph. The heft of the instrument, its appearance and its performance, AT LEAST equal those of much more expensive timepieces. A great buy which I wear proudly! Fantastic watch, many comments and looks, weighs a ton but with the looks worth the weight. Have a slight problem in that the glass had a chip fall out, it is large but down at the twenty five mark, extends from the twenty two mark to the twenty eight second mark. Bought the watch here on line but no one can find records of the purchase. Still waterproof so it stays on my wrist for now. I had to wait for my watch to arrive when it did arrive and opened the box I was over whelmed.It was such a beautiful watck .Now I cannot wait for the jewellers to open to have the strap adjusted to my wrist.This is one of my best,Thanks. 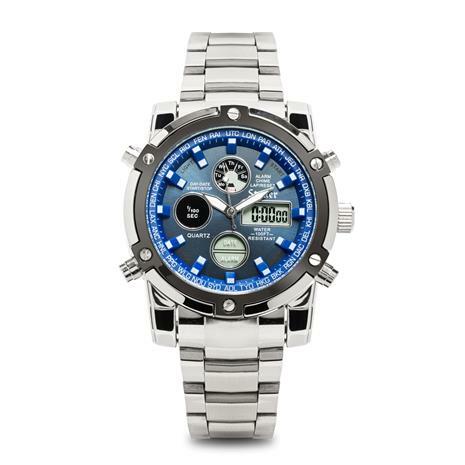 Blue Stone Chro is a great watch for its price. was actually surprised at the size a bit larger than i expected, i soon fell in love with the ease of features, the Blue face + digital time and date, the best feature for me is the light. Nothing was overlooked in the details, well done !! Added to my Stauer collection. My first Stauer purchase, but not my last! Lovely watch!! Like many of today's popular styles, it is large and heavy. But it is also easy to read. The instructions are not as straightforward as they might be. But with some thinking and trial and error, you will accomplish a perfect setting. I was impressed with the beauty of this time piece when I first saw it in a mailout and had to order one. It is better looking on my wrist. Very good quality. One of the best I have ever owned and I am a former aviator who has owned many. if Ned from Quitman AK has not had his watch adjusted yet, a quality jeweler can do it. I had 4 links taken out and needed the fifth, but it was not available. Therefore, I have a slightly loose watch that takes control of my left wrist because of its weight. This is a beautiful watch that garners looks and compliments wherever I go. This is my ninth Stauer watch and one of my favorites. As always great quality and value. Love the watch, but had the same problem with random alarms/chimes as DENNIS from FT WORT TX. Instructions are poorly written and don't seem to work as expected. Still trying to get chime silenced. Every once in a while a timepiece comes along that’s so jaw-droppingly good looking and masterfully equipped that it stops us stone cold. Striking in appearance and fully equipped with features, this is a watch of substance. A watch that can take you seamlessly from the 18th hole to the board room. We’re talking the Blue Stone Chronograph, and it sits at the top of the discerning gentleman’s watch list. The passage of time, mastered: The Blue Stone merges the durability of steel with the precision of crystal movement that’s accurate to 0.2 seconds a day. 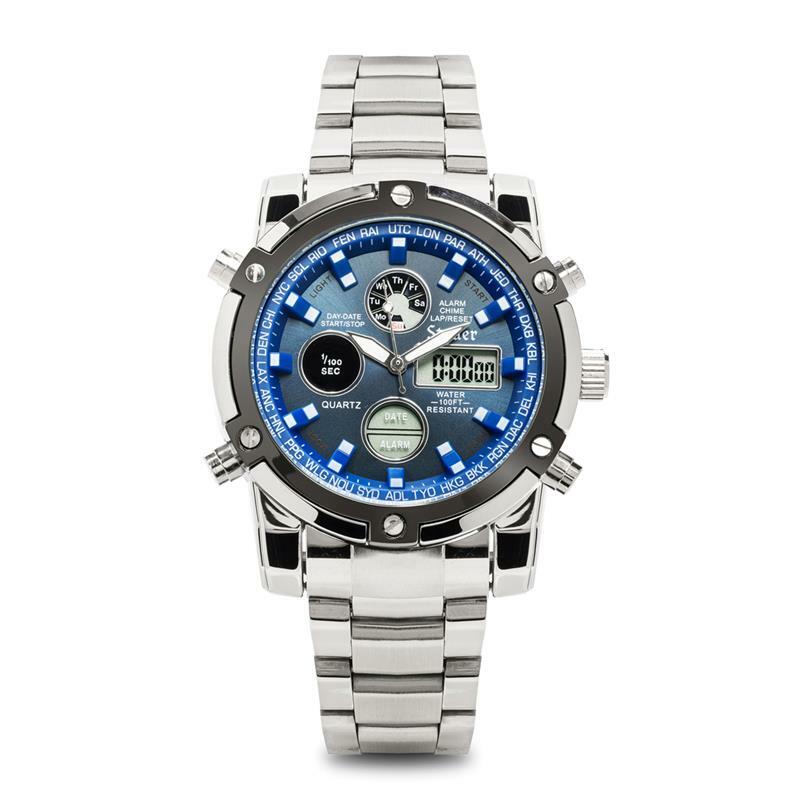 Both an analog and digital watch, the Blue Stone keeps time with pinpoint accuracy in two time zones. The watch’s handsome steel blue dial seamlessly blends an analog watch face with a stylish digital display. It's a stopwatch, calendar, and alarm–– keeping you on schedule right down to the second. A watch of this caliber would cost you a pretty penny if you shopped big names. But overcharging to justify a big name makes us blue in the face. Which is why we make superior looking and performing timepieces priced to please. Decades of experience and strong connections in the horology industry enables Stauer to put quality on your wrist and your hand out of your wallet.